West Environmental Services Ltd management has been involved within the demolition industry for over 25 years and is fully conversant with all aspects of demolition work, applying the latest methods and cutting edge technology to all its projects. The experience and knowledge that our management has collected and advanced over the last 25 years is continually used to undertake the safest, quickest and most economic solution to the complete demolition of all types of industrial and commercial projects that we are entrusted with. This includes the appropriate waste removal, transport and final disposal through the correct waste stream, including recycling of up to 80% of the waste produced from the work. At West Environmental Services Ltd we believe that with the continuous upgrading of plant and equipment along with rigorous training to develop the skills of our workforce and sub contractors we can continue to meet the high standards that the industry and our clients expect. All our operatives are trained and supervised to the Third Edition British Standard Code of Practice for demolition. BS 6187:2000. We can provide details of specific contracts and references upon request. 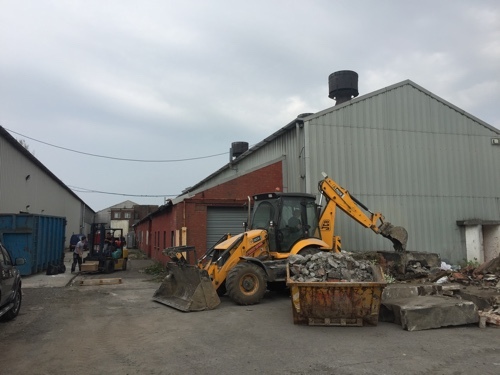 West Environmental Services Ltd are always interested in the purchase of complete works, plants, factories, brown field sites, redundant machinery, stores etc.